We heard that when you have a baby they turn your life upside down and that is the truth!! As you all know Jason has been a big fan of the gym and it's his stress outlet. Prior to Brody's arrival Jason worked out twice a day and always maintain a HOT bod...while he still has a hot bod, he's certainly not spending as much time at the gym as he used too. And me...well I was always a hit and miss gym girl...going because i had to not because i wanted too. Anyway, neither of us have been spending anytime at the gym or getting any physical activity, just seems there is not enough time in the day. So we decided that if we are going to be swim suit ready by Sept for our trip to Aruba we needed to start working out. 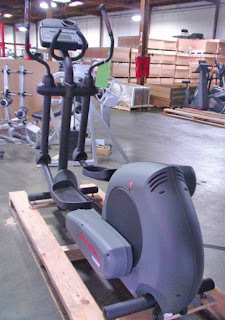 Jason did a ton of research on gym equipment and yesterday we finally took the plunge and bought a used Lifefitness elliptical machine for our basement! Ohhh brother...now that means I HAVE to workout as I have no excuses anymore...time to work on getting this jiggly post baby body in order! !